Gripping her ax tightly, Astrid cuts through the sky on Stormfly, ready for any challenge that may come her way. 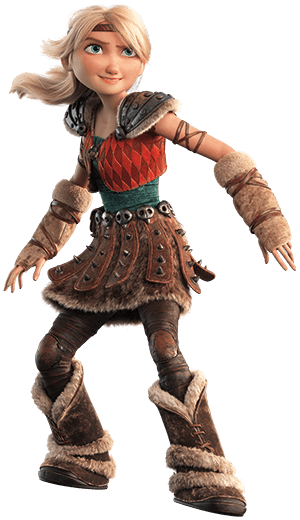 As fierce as she is clever, Astrid Hofferson is perhaps one of the most valiant warriors Berk has seen. From the time she was in Dragon Training, Astrid was fully committed to Berk’s traditions of fighting dragons. However, in the years since Hiccup and Toothless shook up the Viking world with their friendship, she has become one of the best dragon riders in the archipelago. When Astrid was younger, she was incredibly competitive and impatient. She wanted to be the best student in Dragon School and did not suffer weakness or incompetence from her peers. 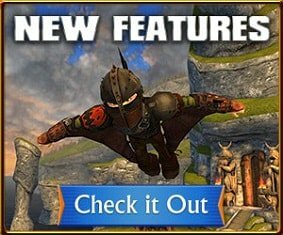 When Hiccup started to show skills in Dragon Training, Astrid became jealous of how quickly he rose to the top of the class. All that ended after she learned of Hiccup and Toothless’s bond, she began to come around. This was the beginning not only of her friendship – and later romance – with Hiccup, but this meeting also set her on the path to becoming a strong advocate for a Viking-dragon alliance. After Astrid and Hiccup’s first flight together, it was not long before she began to develop feelings for him. During the fight against the Red Death, Astrid rode into battle with Hiccup, Toothless, and her other classmates on the blue Deadly Nadder, which she named Stormfly. As Astrid has gotten older, she has become more level-headed and less abrasive. Despite her maturity, she is still just as fierce on the battlefield and has become one of Berk’s best dragon racers. Recently, Astrid has gotten engaged to Hiccup and is excited to marry her best human friend. As the fiancée of Hiccup, she is always ready to support him and stand by his side, whether in times of war or peace. She and Stormfly flew beside Hiccup and Toothless in the battle against Drago Bludvist and his Bewilderbeast. In this conflict, Astrid met Hiccup’s long-lost mother, and mourned the death of her future father-in-law, Stoick the Vast. When not battling villains or chasing the wind on Stormfly, Astrid is one of our most eager teachers at the School of Dragons. You can find her at the Training Grounds, in Berk, and in the School of Dragons. She is always willing to lend a helping hand in Flight Club, on a mission, or in battle. If you think you have what it takes to fly alongside one of the greatest young warriors Berk has seen, then grab your sharpest ax and put your Viking skills to the test with Astrid Hofferson! Meeting Astrid Hofferson was like a dream come true! As a young Viking, I always heard stories of her bravery and cleverness, and I began to see her as a sort of role model. I would run around with an ax that was way too big for me, swinging it around and reliving the stories I had heard of her. Today, those dreams have come true. I haven’t been a student at the School of Dragons very long, but with lessons and training, I haven’t had the time to seek her out. Today, however, I came across her in Berk. She even gave me a quest to complete! Astrid asked me to help look for some help recovering some racing sheep that had gotten loose. As I set out to complete this quest, my heart is pumping and I cannot keep the grin from me face. I must have been blessed by the gods for Astrid to place her trust in me. Whether it’s a blessing or luck, I will not fail! I shall set out with nothing but my fierce determination and unyielding courage so that Astrid Hofferson will see that I am a warrior at heart, just like her.